Bndtools is framework or set of libraries, which make OSGi bundle development very easy. It will automate some of the configurations and bundle dependencies resolution in the development. It will provide set of tasks and configuration, which makes OSGi developers life easy. 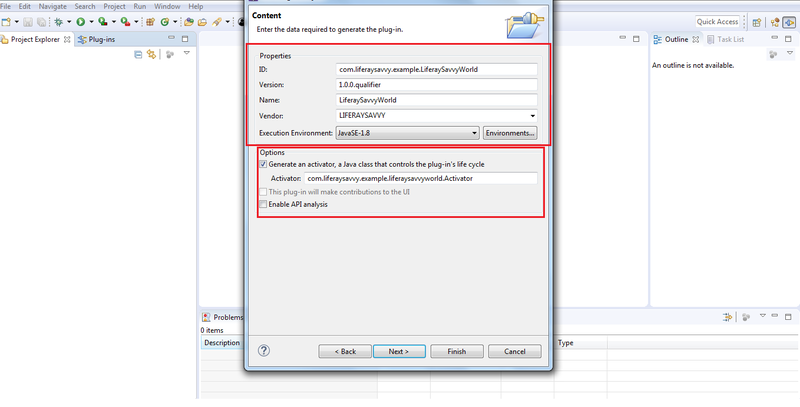 BND Tools provides the eclipse plugin so that we can install plugin in eclipse. BND tools also available for different build tools like MAVEN and Gradle. The following are the different environment plugins that will provide Bndtools capabilities in the OSGi bundle development. BND Plugin for Gradle is plugin, which provide BND capabilities in the Gradle build environment. BND Plugin also provides the maven plugin, which we can use in the MAVEN, based OSGi bundle development. BND also support ANT build environment. However, ANT already older one no longer use in the projects. So do not have much information. 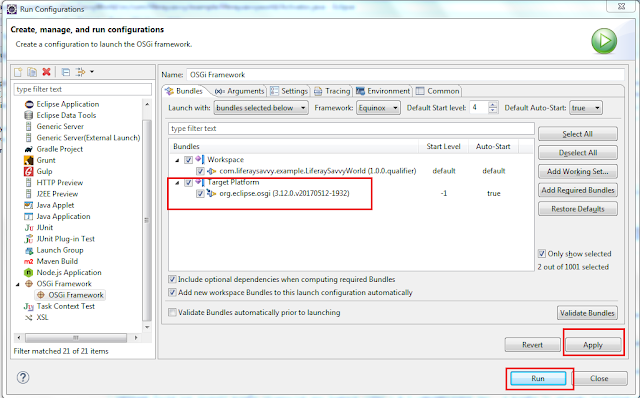 BND capabilities also available in Eclipse IDE. 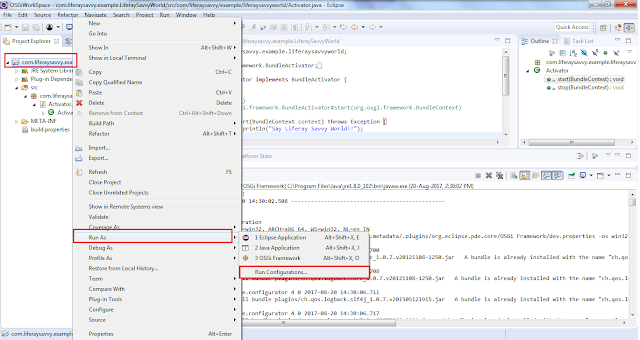 We have BND tools plugin in the eclipse market place or we have plugin package file we can install in Eclipse IDE. Apache Felix Maven Bundle Plugin is maven supported BND plugin, which will use in Apache Felix OSGi implementation bundle development. Gradle OSGi Plugin is Gradle plugin that come with Gradle build tool. OSGi-Run Plugin is another implementation that available in Gradle. It will create and run the OSGi runtime. OSGi is a standard that defining Dynamic Component Development for Java. Its specification that define the API to develop dynamic components in java application development. As per OSGi application composed of several components and components are packaged as bundle. Java to build complex application is big challenge where OSGi defining way to divide application into several bundles and each bundle composed with several components. OSGi is providing environment where all these bundles and components can communicate each other such way we can run complex application. Component is small unit of application and it called as some feature in the application. Component cam work independently or it can collaborate with other component to full fill the requirement in the application. Bundle is composed with several components and OSGi we package components as bundles and we will deploy bundles into OSGi container. Services are part of component and it will full fill one more tasks. OSGi we can export and import services such as way we can make available services to other components or bundles. Module is basic terminology in OSGi modular development and these modularity concept achieved through bundles. Modules and bundles are same. OSGi architecture divided into several layers. I have taken the following picture from enRoute. 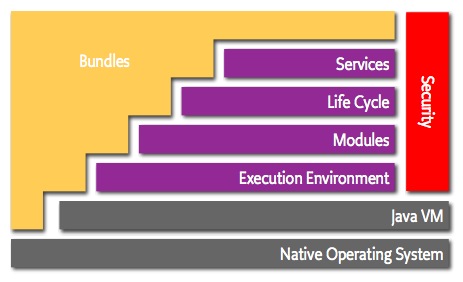 Bundles are packaged components developed by OSGi developers. Bundle is packaged as JAR file and we can deploy into OSGi containers. Services layer provide mechanism to share services between bundles. It will provide environment to register services and make available to other bundles. We have concept called publish-find-bind. We have different framework to achieve this concept. Declarative Services and Apache Service Component Runtime are the implementation for this concept. Life Cycle is responsible to manage lifecycle of bundles. OSGi bundle have several lifecycle stages install, start, update, stop and uninstall. All these stages handles in this layer. 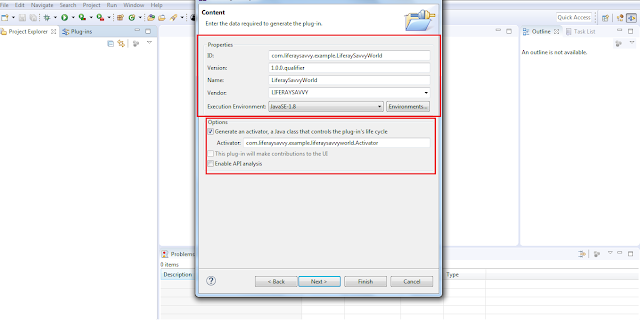 Module layer is define the import / export the code of the bundles. Usually we will use export/import headers in the OSGi manifest file that will handle in module layer. 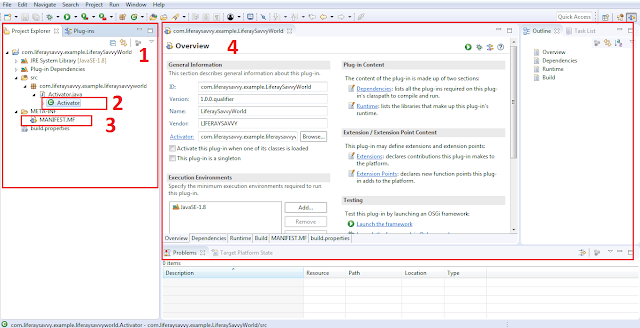 Execution Environment layer define the classes and methods are available to the platform. Security layer define standards security to the OSGi applications. How your modules available to the other platforms and it will define some permission system. Java VM layer is provide the JAVA run time environment. Its basic layer in the OSGi. It will provide standard Operating System to the OSGi environments. OSGi provide run time container there we can deploy bundles. Bundles are standard package system where we can package all java classes and interfaces. Bundle is JAR file. We have different commands provided by OSGi command line interface to deploy bundles. OSGi specification implemented by several vendors’ popular vendors Equinox and Apache Felix. We can develop OSGi application which target to anyone of these implementations. Both implementations are followed the OSGi standard specification. There may be few features vendor specific but most of the implementation as per OSGi specification. OSGi is java modularity development framework. We can divide complex application into multiple modules and OSGi will responsible to communicate all modules and make it as single application. OSGi is framework provides the run time environment so that all these module can communicate each other. In OSGi terminology we can call each unit as bundle. Bundle is independent component in OSGi and it can run in OSGi container. OSGi container is responsible to handle lifecycle of bundle. In this article we are going to see develop basic bundle development using eclipse and will run in OSGi run time environment. Basic OSGi bundle development without eclipse and run in Apache Felix OSGi run time environment was explained in below article. Install Java 8 and set JAVA_HOME environment variable. We are using eclipse-jee-oxygen for this example. 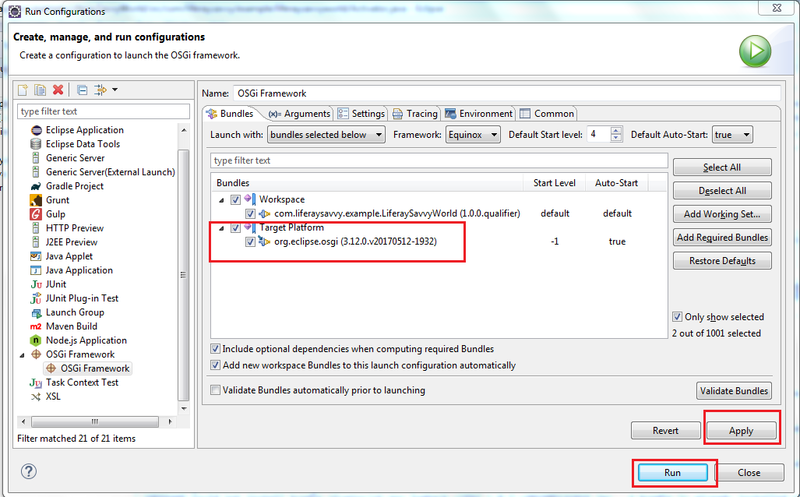 Any bundle in OSGi need activator java class and it is responsible for managing bundle lifecycle in the OSGi container. So each activator class should extends “BundleActivator”. When we create bundle with eclipse it will create basic template with Activator class and if we observed the activator class, that extends “BundleActivator” class. Once you download the eclipse extract it local machine then you can find “eclipse” directory. Navigate to “eclipse” then click on eclipse icon then eclipse will be started and initially it will ask workspace for your projects then select your workspace directory. 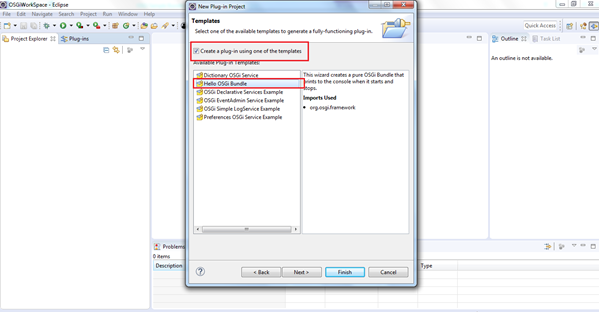 Create OSGi sample bundle in Eclipse. 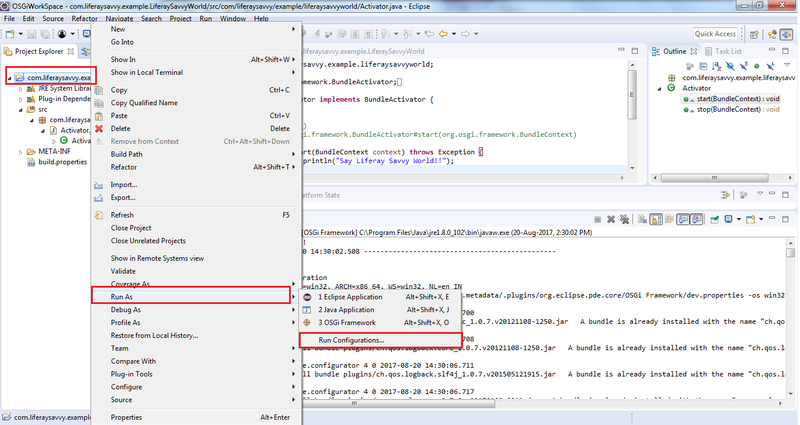 It will open project selection Dialog then select “Plugin-in Project” click on next. Once click on next then you can see another dialog there we need to provide your project name then click on next. 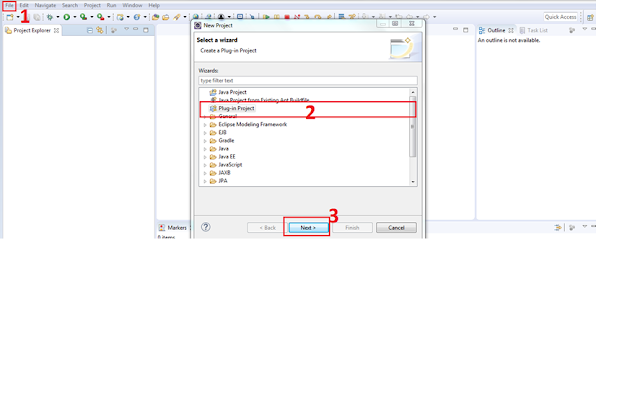 Once click on next we can see other dialog there it will ask information which will be used in the bundle MANIFEST file. Information like name, version, vendor and execution environment. Click on Generate Activator class check box then give your Activator class name. Finally click on finish button then bundle will create with basic activator class. start(--) : This method will take the argument BundleContext and container will invoke this method to start bundle. stop(--): This method also take BundleContext as argument and OSGi container will invoke this method to stop bundle. 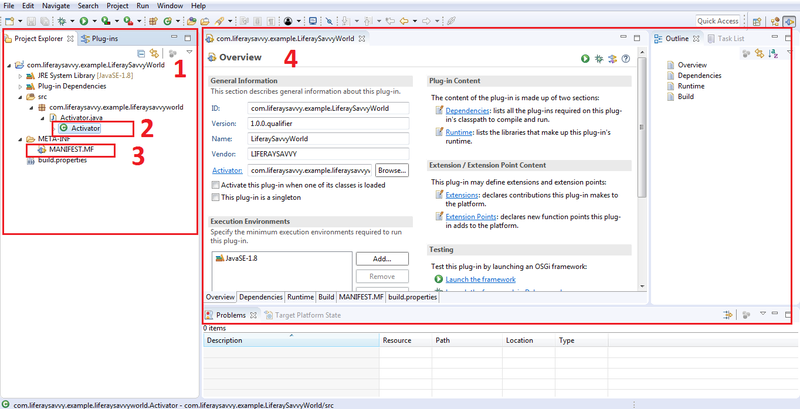 MANIFEST.MF is deployment descriptor for the bundle and have more information and it will be used by OSGi container. This is core resource of the bundle. This header tells that bundle follows the OSGi specification and value 2 specified, it is following SGi specification Release 4; if it is value 1 its means it is following the compliant with Release 3 or earlier. Its important header for bundle and it is unique name used to refereeing it in other bundles when it communicate to other bundles. Its simple version number for the bundle. We can start and run version specific bundles in the OSGi container. Bundle-Activator headers tells the Activator class name and it will used to manage life cycle of bundle by OSGi container. The Bundle-Vendor header is just human readable name which tell the vendor who implemented the bundle. Which tell the Jave environment is required to execute the bundle. You can see Output in the console as follows. Bundle will be started by OSGi container then it will invoke activator start method start() then we can see message in the console. If you want execute bundle in Apache Felix environment then select Apache Felix OSGi implementation for Targeted platform. Just type Felix in the filter text input then you can see Felix implementation jars. Here is example how to run bundle in Apache Felix Environment. Look at “Install and Start bundle in OSGi” Section.